NIOSH approved against certain organic vapors, acid gases and particulates. Use with 3M™ Half and Full Facepieces 6000, 7000 and FF-400 Series with bayonet filter holders. The 3M™ Organic Vapor/Acid Gas Cartridge/Filter 60923 P100 helps provide protection against certain organic vapors, acid gases and particulates in a variety of environments. The cartridge/filter combination may be used for respiratory protection from certain organic vapors, chlorine, hydrogen chloride, sulfur dioxide, hydrogen sulfide, hydrogen fluoride, and non-oil and oil particulate concentrations up to 10 times the Permissible Exposure Limit (PEL) with half facepieces or 50 times PEL with quantitatively fit tested full facepieces. This cartridge/filter is not for use in environments that are immediately dangerous to life or health (IDLH). Recommended applications for the cartridge/filter include chemical manufacturing, laboratories, petrochemical, and pharmaceuticals. 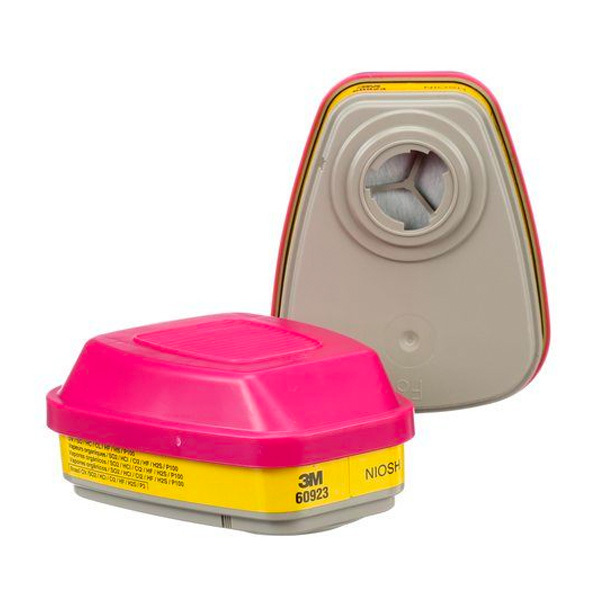 Inventory needs and training requirements for safety equipment are reduced because this respirator cartridge/filter selection works for many different applications. This cartridge/filter is commonly used in the following industries: chemicals, general manufacturing, and pharmaceuticals. This organic vapor/acid gas cartridge/filter works with 3M™ Half and Full Facepieces 6000, 7000 and FF-400 Series with bayonet attachment holders. The cartridge is NIOSH (National Institute for Occupational Safety and Health) approved for environments containing acid gases and non-oil and oil particulates. The cartridge has been assigned the color code “Magenta/Yellow” in the NIOSH system. Breathing organic vapors, acid gases and particulates can pose a risk to your health. NIOSH, a Federal government regulatory agency, has tested and approved the 3M™ Organic Vapor/Acid Gas Cartridge/Filter 60923 to help reduce exposure to certain organic vapors, acid gases and particulates.